As Hungarian writer Frigyes Karinthy proposed in his six degrees of separation theory, any two people in the world are separated by no more than a chain of 6 acquaintances. 6degrees, a Singapore-based phonebook app, is named after the theory and aims to make connections simple. According to Niranjan Rao, founder of 6degrees, one of the amazing things about modern life is that we have all our relationships, like families, friends, colleagues, at our fingertips. However, it is also very easy to lose contacts of all the relations because our phone contacts are currently offline. The only way to update contact information like email address, phone number, house address is to send mass messages, even if you are already connected on other social networking services, like Facebook, Twitter. It is a messy affair to send such messages and your friends also have to update these information manually. That’s how you lose touch with friends, said Rao. 6degrees is a personal contacts manager, allowing users to update their information on friends’ phones whenever they change their contact details- and vice-versa, provided that they are also using the same app. Moreover, the app will backup contacts on the cloud to avoid the mess caused by loss of phones. 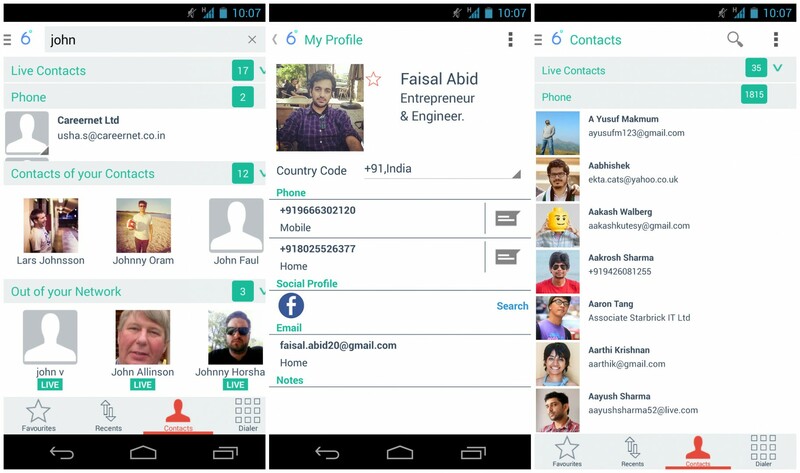 It also has a feature which helps users to merge or delete duplicate contacts on their phones. Another interesting feature of 6degrees is the people finder. Normally, when users search people on their phones, it will only show contacts stored in the phonebook, that’s your first degree of contact. 6degrees will show the contacts of your friends’ friends to expand the social circle. Users can require the contact of a certain person from mutual friends. As for privacy control features, users can hide their contacts or create a trust list of people who have access to their contacts. “Just like your can search for people, you also can search for businesses, like cafes, convenience stores, etc. This is great for small businesses, because now people can search them not from some separate app but from their own phonebook”, Rao added. In the last six weeks, 6degrees recorded more than 6,000 downloads from 80 countries in seven languages of English, Chinese, Japanese, Korean, Spanish for Latin America and Portuguese in Brazil, and Arabic for middle east, said Rao. He added that the biggest markets for the app are US, India (English-only), Brazil and the Middle East with the languages of English, Portuguese and Arabic. With an Android and web version already available for users, the iOS version is coming next week and the windows phone version is expected to be released by the end of May, Rao confirmed. 6degrees is incorporated in December last year in Singapore and Bangalore by Niranjan Rao, an engineer-MBA with many years experience in investment industry, and Arun Samudrala, who has over 13 years experience in the field of technology, including eight in Silicon Valley.